These words, which seemed like an afterthought, were the comfort and the challenge posted on the bottom of the May term poster for travel writing. Back in September, the sentence played on repeat through my head; I was intrigued. Though I still have reservations, I have begun to embrace the English major in me this year.Sure, I can analyze, I can make good grades, but can I write? In two weeks, nine other students and I will spend three weeks practicing what the poster advertised, “putting words on the page, experimenting with language, and testing each other” in – I can hardly believe it – Cambodia. The thought of the adventure I will soon embark on is both exciting and frightening. The person leading this trip, though, excites and frightens me even more: Dr. Hanstedt. I feel like a kid facing the high dive for the first time. I’m already wet and I know the water is fun. I’ve been swimming in words for a while, and I haven’t drowned yet. But isn’t splashing around good enough? Like that diving board, I have two compromising instincts when I face Dr. Hanstedt. First – turn the other way. You don’t need to jump. This springy board is new and different and wayyy up in the air and…anything could go wrong. But the curious side of me, the part that always wants to experience and grow, makes me climb the ladder and walk to the end of the board. This might be unfamiliar, but it is probably way more fun than wading in on the steps. Paul, as he has said we can call him, is my high dive; he is both intimidating and inspiring. I had him for Rhetoric last semester, the class that broke my 4.0. I was probably a little more ticked about that than I should have been, but I love this professor anyway. I’ve known him for almost a whole school year, and I still really don’t know what to make of him. Typically dawning a gold earring, desert boots, and an intermittent curse word, he is a self-described six-foot, bald “white boy from Wisconsin.” I remember the first appointment I had with him to discuss the draft of a rhetoric paper. I realized his presence is a lot easier to handle in class when there are nineteen other students. Alone, he was cordial, but also stand-offish. As he read my draft, one I had put a lot of effort into, I could hardly handle it. “Oh gosh,” I thought. “Why is he so intense? This will never be good enough for Dr. Hanstedt. He probably thinks this is so mediocre.” Internally, I shriveled in fear; externally, I maintained my composure. I knew he was a talented writer and teacher. My confidence was the same as a shrimp, but I knew this man could teach me a lot more about the art of language and the craft of writing. In the weeks preparing for Cambodia, I have gotten to know him a little better, and, though his huge presence continues to emanate, I am not quite as scared or overwhelmed. He can be encouraging, and he is always honest. Depending on the student he might say, “This is good, but what else could you do with it?” or “Trash it. You’ve got better words than that.” He knows how much you can take. So, seven months ago, allured by Southeast Asia and Dr. Hanstedt, I subdued my instinct to run far, far away from Paul, and I applied for his May term. I might enjoy a similar tropical climate as my classmates frolicking on Hawaii’s beaches, but based on the syllabus I skimmed this past Friday, my time won’t be spent laying out in the sun. As Microsoft Word becomes my new best friend, I don’t think I’ll lack topics to share with it, though. Cambodia is totally foreign to me. This country is still mourning from the atrocities of the 1970s Khmer Rouge regime. Or, more appropriately, genocide. 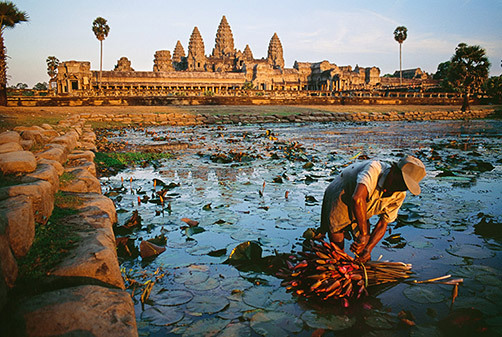 Its thick jungle is home to Angkor Wat, an impressive ancient Hindu temple. I think it’s fitting that the largest religious monument in the world belongs to natives who are very spiritual and highly superstitious. I am prepared to encounter questionable food, unbearable humidity, and, apparently, the cutest kids alive. I’ve got some adventure in me, and as exams hover in the coming days, our 22-hour plane ride becomes more and more appealing. Ingesting the unknown and calling it a meal doesn’t scare me. The foreign and unknown makes me more excited. It’s the focus of the trip, intimidating me the most right now. Travel writing. Paul. Ugh. As we prepare to go, I am reading travel writing articles, and all I can think is how I so cannot write like that. “Immensely flavorful, unerringly memorable.” How did he string such a beautiful set of words together? “22 hours origamied into coach” Who thinks of an airplane ride halfway across the world in that way? I want that – to express myself succinctly, naturally, and artistically. I am not a creative writer, but I have the itch, and I know Paul can help me scratch it. Yes, he scares me. Writing well scares me even more. As our departure approaches, though, I am becoming more comfortable with the idea of spending a month exploring the charm, pain, and people of Cambodia and translating my experiences into words worth reading. Practicing. It’s work, and often times that doesn’t make it too much fun. As we traverse this country, mile by mile and page by page Paul is going to open two worlds to me – that of Southeast Asia, and that of the creative writer. Here I go. I’m jumping off the diving board.